It’s tech pitch season in San Luis Obispo, with Cal Poly’s HotHouse turning out a crop of startups angling for funding and Softec and other groups gearing up for a fall symposium that promises to draw hundreds of listeners and, hopefully, a few investors. The Cal Poly effort has kept students focused on business ideas all summer long, providing expert advice and office space. Softec’s Tech Pitch session, coming up Oct. 24, will be open to those startups and any other ones on the Central Coast with an application deadline Sept. 12. Here’s a closer look at each event. The SLO HotHouse is overseen by the Cal Poly Center for Innovation & Entrepreneurship and the Cal Poly Small Business Development Center for Innovation. It’s funded and supported by alumni of the school. It provides space, mentorship and focus for student startups over the summer. 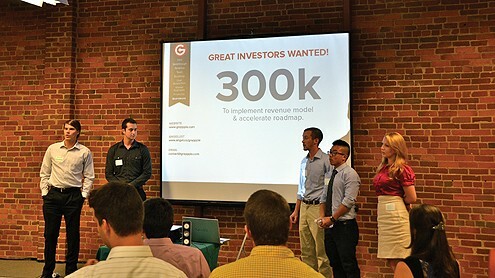 On Aug. 30, the HotHouse held its “demo day,” when participating startups made their pitches to supporters and investors. Seven companies presented. One was Genicell, founded by a group of biomedical engineering graduate students. They have come up with a way to manufacture blood vessels in a lab. “It’s a lot quicker to get data from our system than it is testing animals, and it’s much more scalable,” said Mike Machado, one of the co-founders. The system starts off with cells gathered from animals or humans and then uses culturing techniques, along with some mechanical engineering smarts, to grow the vessels on a scaffolding in a bioreactor. Automation and scale are key: Pharmaceutical companies typically run computer simulations to decide which drugs to test in animals, but the failure rate in animals is still about 98 percent. “Twelve hundred drugs per year will fail that test, and 30 will pass. What we’re aiming to do is insert ourselves between computer simulations and animal testing. We aim to supply drugmakers with a lot more data on which drugs are likely to fail in animal testing so they can get drugs to market more quickly,” Machado said. Machado said the advice at the HotHouse was key in helping the company, which is seeking $500,000 in funding, to find its way. In particular, the company received mentorship from Carl Peck, a physician and scientist who served as the head of the FDA’s Center for Drug Evaluation and Research and now lives on the Central Coast. Genicell is in discussions with Cal Poly over how to approach intellectual property transfers, and plans to move to the Bay Area to take up lab space. But Machado said his team won’t forget their Cal Poly connections. “We’re going to stay in contact with the great mentors we had a the HotHouse and use their advice on where to go from here,” he said. Another startup, Grappple, is staying put on the Central Coast while it rolls out. The company, which is looking to raise $300,000 in seed funding, has built what it calls a “social bucket list.” The company hopes that by helping users define and sahre their big dreams, they can accomplish them. It plans to roll out the service on the Cal Poly campus this fall, with a wider public beta test later this year. Next year, it will start testing out revenue models. Those range from special offers — users who have always wanted to go to Australia could be shown a travel package — and sponsorships. Softec, the Central Coast nonprofit that supports the tech community, is holding its 16th annual symposium on Oct. 24. The event usually draws hundreds, and this year it features Shopatron CEO Ed Stevens as keynote speaker and is structured as a pitch event in collaboration with the Caly Poly entrepreneurship groups and the Economic Vitality Corp. of San Luis Obispo County. While money won’t be handed out at the event, EVC-SLO President and CEO Mike Manchack said a major goal is to get some funding flowing from investors. Softec will be vetting pitches for acceptance prior to the event, and the deadline for applications is Sept. 12. See www.techpitch.org for more details.